Identify & reduce bottlenecks and constraints. Predictive analytics, and real-time optimization. Capacity planning and growth projection. Kaizen, and LEAN Six Sigma implementation. Increase manufacturing efficiency while minimizing risk using manufacturing simulation software - Simcad Pro. Automatic Bottleneck identification including detailed reporting on constraints and contributing factors. Analyze the effect of changing equipment and new technologies including automation. Integrated costing analysis, scenario analysis, and dynamic KPI/Metric reporting tools. Identify optimal manpower levels and the impact on operational efficiency. Analyze the impact of shifting schedules and cross training employees. Define detailed shifts, including holiday schedules, planned and unplanned breaks, vacations, and sick days. Automatic Schedule Generation and optimization. Proactive forecasting and dynamic production scheduling. Schedule comparison and deviation analysis. Capacity Planning - Identify current capacity and constraints, plan for increased demand. Growth Projection - Integrated scenario analysis provides graphical comparison among different implementation plans based on expected growth trends. Automatically generated dynamic value stream mapping and detailed lean analysis. Integrated LEAN/TQM/Six Sigma Tools including Dynamic Value Stream Mapping provides kanban sizing, reorder triggers, line balancing, inventory optimization, safety stock levels and more. Load leveling, Kaizen effects, and kanban optimization. I want to start working with Simcad Pro. Free trial download – No limitations on model size. No disabled features. In addition to a number of fixes and improvements. A Patented No-Coding modeling environment delivers On-the-fly interactive dynamic simulation and reduced model development time. Modify the model during the simulation run, analyze the impact of constraint changes without the need to stop/restart the simulation. Make all the changes LIVE, WHILE THE SIMULATION IS RUNNING! A built in, animated 2D and 3D Visualization engine provide both 2D and 3D visualization with animations. Includes Custom dashboards, full 3D Animation capability, Auto-scaling from CAD files, collision detection, and support for a large set of 2D and 3D file formats. External Data Systems(Extensive connectivity to most data systems) - Unlimited number of external data connections or applications. Connect prior to, during, and after the simulation run. Analyze data with the built in Scenario Manager, or export it to a wide variety of applications. 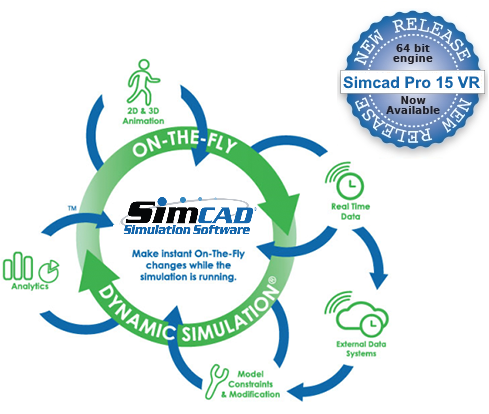 Simcad Pro’s patented on-the-fly interactive simulation provides a truly dynamic modeling environment. Interacting with simulation models while the engine is running drastically reduces development time and provides a greater understanding of the system and how constraints impact the operation. Interactive simulation models help acheive unmatched model flexibility and expandability. 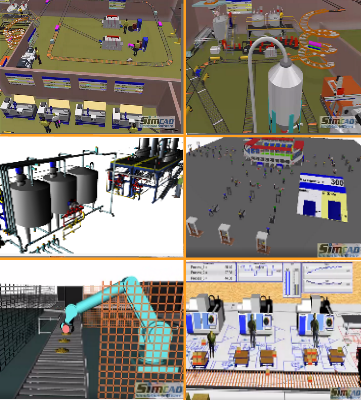 With every model built, Simcad Pro automatically computes and generates the model Value Stream Map and all required Lean Analysis including, Spaghetti Diagrams, Swim Lanes, heat maps, efficiency and OEE analysis. Achieve an average of 50% reduction in model turn-around time with On-The-Fly Interactive Dynamic Simulation. Our Mission: Provide organizations with the required tools and know-how to ensure competitive advantage and sustainability in an ever-demanding world market.